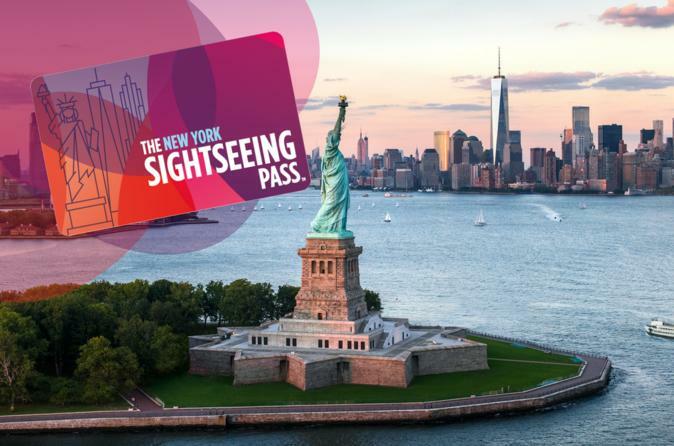 Unlock unlimited possibilities with access to New York City's top attractions, museums, tours, restaurants and entertainment and save big with the Sightseeing Day Pass. You'll have a ticket to the hottest attractions including One World Observatory and Top of the Rock, The Guggenheim Museum, Intrepid Sea, Air and Space Museum, The Statue of Liberty, Gray Line Citysightseeing Buses, Circle Line Cruises and more. Choose a 1, 2, 3, 5 or 7 day attraction pass and own the city! Where you go and what you do with this fully-customizable, money-saving pass is up to you. Soak up 360-degree views of the city from on top of One World Observatory, explore New York aboard a hop-on, hop-off sightseeing bus trip, visit the Intrepid Sea, Air and Space Museum, and more. If you’re looking for an activity, try out a fun range of tours like street art tour of Brooklyn, a Soho and Little Italy walking tour, or a multi-hour bike rental. The choice is yours. Purchase your Sightseeing Pass online and receive it directly via email. With the purchase of The Sightseeing Day Pass, you can visit as many attractions as you wish within your chosen duration (1, 2, 3, 5, or 7 consecutive days). Simply present your pass at any participating attraction to gain free admission. Your pass comes with a special mobile guidebook that includes attraction information, hours of operation, money-saving discounts, and more. For a complete run-down of attractions and activities, please see the itinerary details below. Special Offer - Book and save 23% compared to the local supplier's prices! - Book Now!